Information on exercise and fitness. First, let me say, this is not yo’ mamma’s bridge walk, when 50,000+ people stroll across the Mackinac Bridge each year on Labor Day. This is a 5.8 mile timed road race, most of which takes place 552 feet above the chilly Straits of Mackinac on the amazing feat of engineering, the Mackinac Bridge. This is the same bridge that is closed during windy weather, least its travelers be swept off into the water below. The same bridge where a Yugo driver met a watery grave in 1989. The same bridge where 400 or so drivers a year avail themselves of assistance from the Timid Driver program, too frightened to drive themselves across. Though the 5.8 mile distance is almost twice the mileage I’ve ever run, Best Husband and I accept the challenge and train to run Mighty Mac. The day before the race we drive to Mackinaw City at the foot of the Mackinac Bridge, so we’ll be ready to board the bus to cross the bridge at 5:30 next morning. Once we are settled in our hotel room, BH and I begin our pre-race rituals, for most runners, a cross between runner superstition, preparation, and nervous anticipation. BH: Pin race number to front of T-shirt. Me: After checking weather.com, lay out appropriate running clothes for the predicted weather, and affix race number. BH: Lie on bed and nap. Me: Lay out alternate running clothes in case weather turns out colder or warmer than predicted. Me: Lay out running accessories – lucky socks, earrings, heart rate monitor and pre-race food. BH: Continue to lie on bed and nap. Me: Do pre-race manicure with favorite red polish. Me: Stretch hamstrings and tight muscles while nail polish dries. BH: Wake up from nap and ask if it’s bedtime yet. It tuns out that BH is much more relaxed about this run than I am. Next morning we rise early, wanting to be one of the first to get on the bus to take us to the start at the north side of the bridge. The enthusiasm among the runners as we board the bus is almost palpable. Mostly young people, in assorted neon, black tights and warm weather gear, as we expect it to be a little chilly that high above the straits, which only a month or so ago still sported ice floes. I capture the pink sky with my iPod as the sun gets ready to peek over the horizon on our right as we cross the bridge on the bus. And then, it’s showtime, Unlike most races where the runners congregate at the start line and take off all at once, this is a staggered start, since there is not enough room on the bridge to send off all the runners at the same time. We start off with the sun rising on our left, and a mild breeze coming off the water on our right. For this far up in Michigan in May, this is about the most perfect weather we could hope for. There are no mile markers, no cheering crowds, no water stations – just a few race monitors scattered across the bridge. It feels like we had just decided to get up early one day and run across the Mackinac Bridge on our own. But despite this idyllic setting, I’m having a little panic. I’ve never run this distance, and once you’re out on the bridge, the only way off is to finish. It’s a gradual uphill to the halfway point of the bridge, roughly 2.5 miles. From there, the rest of the way on the bridge is all downhill, then just a few blocks through the city and we’re done. I can do this. 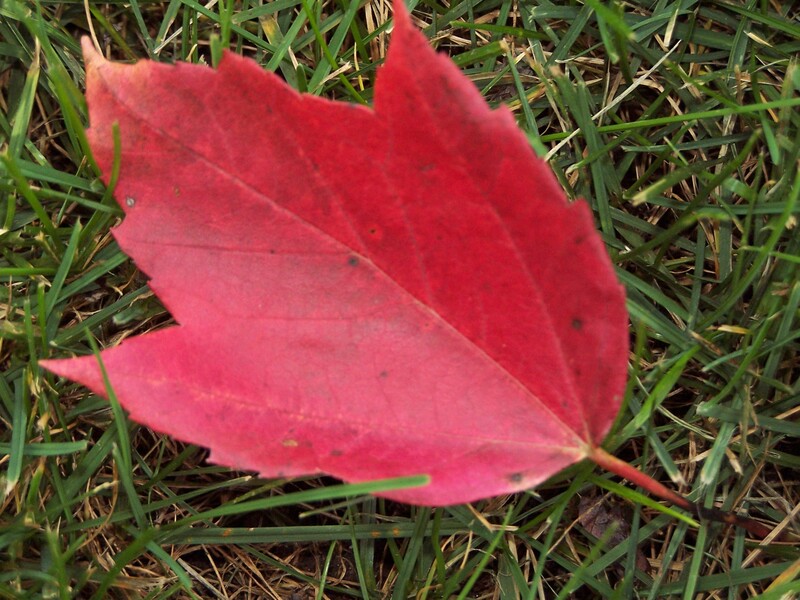 BH and I take off together, pacing each other, as we’ve decided to run this together. As we pass the half-way point, I know I’m home. Still amazed at how well I’m doing, we speed up on the downhill side of the bridge. We finish the last few blocks through the city, still quiet this early in the morning, and bring it home, well under the time I predicted for myself. Running Mighty Mac was by the far the most amazingly beautiful race I’ve ever done. Will I see you there next year? HG, BH and Mighty Mac in the distance. Aha. You thought this was going to be about something else, didn’t you? But, alas, it is indeed about another very important issue of dissatisfaction for women: clothing sizes. Most women, at least in the states, have grappled at some time with the inaccuracies and frustrations of women’s clothing sizing. Unlike men, who will find their sizes fit true in almost any store, catalog or online retailer, women are constantly guessing at sizes, trying on items in every store, and mailing online purchases back because what you thought would be a size medium turned out to really be sized like a small. Sigh. There probably are a few perfect size zero women out there who don’t have to deal with this, but I expect most women know exactly what I’m talking about. Then, there is the sizing secret code terminology. Men have it easy. Sizes are clearly described as regular, tall, short, portly (a diplomatic code word for overweight), and slim. But for women? Nooooo. I clearly remember the day I explained what women’s clothing terminology actually means to my sons. Misses or missy is code for average or regular, and uses even numbers such as 2, 4, 6, 8 etc. . Juniors is for average height but slim build, and uses odd numbers – 3, 5, 7 etc. Petite is for short women 5′ 3″‘ and under, but of small to average build, and uses even numbers. Half-sizes, probably the most confusing of all, is for short women of stocky/overweight build, and uses even numbers with half added. And women’s, which one might think is actually what should be for all women, is in fact, for average to tall height and stocky/overweight build. Whew. My kids stared open-mouthed at the end of this explanation, and said “nuhuh.” I concur. Sizes such as small, medium, large, extra-large, are especially problematic. If I buy a regular T-shirt, I can probably get a small or medium. But if it is a fitted tee, I would have to get a large or extra-large. But generally fitted tees don’t come larger than large, so if the large, which actually fits more like a medium or small, is too small, I am out of luck. Case in point: The size chart above is for a pair of ladies exercise compression shorts. I had bought them before so I knew to skip the trying on and go right to my size. This can sometimes be dangerous though, as I’ve often discovered that I can wear a certain size at one store, but come back another day, still the same height and weight, and find that size no longer fits. And my size in these shorts? Large. Yep, large. According to the chart, for my 5’ 2″ height and weight, I should easily fit into a small, or maybe a medium if I want them to be a little more roomy. According to the table, size large starts for women at 5’7″ and 190 pounds, through 5’11” and 170 pounds. Most of the time I know better than to even pay any attention to size charts, but I found this one especially vexing and just had to share. Meanwhile, while I’m going through all this work to find a few things that fit, my husband can walk into any store, pick up a size 32 waist pants, and will find they fit perfectly 99.9% of the time. And I forgot to mention that all sizes change according to the quality of the store. A small in Talbot’s or Macy’s would probably be a medium or large in Wal-Mart or K-Mart. And often two identical items of the same brand and size will fit differently. I could go on and on. So why are women’s clothing sizes so random? Part of it lies in the way clothes are made. If the fabric is at the end of the roll and the cutter is cutting out mediums, the last couple shirts will be cut a little smaller to get more product from the fabric, but still are labeled “medium.” Part of it comes from appealing to women’s vanity. I might feel better about myself if I’m buying a small instead of a medium, unless I start thinking about how my small would really be a medium or large in a less expensive store. Then, it just becomes depressing. Probably many people remember the recent brouhaha over remarks made by Abercrombie and Fitch CEO Mike Jeffries. Jeffries asserted that A & F only carries female clothing up to size 10 (which is really a 6 or 8 in other stores) because “…we only want cool, thin people wearing our clothes…” And that about sums up the problems of women’s clothing industry. Huffygirl in her size large shorts. Fitness Trackers: Are they for you? Because I write about exercise and fitness, I was invited to review the fitness website, SlimKicker (SK). SK is an online tool to track exercise and weight goals and get feedback from the online community. Signing up was easy – I just had to create a user name, password, and enter my goals. I entered my perennial goal of 10 pound weight loss, and SK gave me a suggested daily calorie amount, broken down into grams of carbs, fats and protein, based on the data I entered for gender, height, age and activity level. Later, I found how to calculate this number again, entered the same data, and got a slightly different number. Hmm. Next, I started entering the food I had eaten that day – a small bowl of Raisin Bran for starters. As soon as I recorded this, a pop-up message appeared: “Cereal does not have any protein. Maybe you should have eaten a three egg omelet with vegetables and feta cheese instead.” A three-egg omelet? Seemed like big breakfast for someone of my size, especially since SK told me I only get 1,266 calories for the day (or 1,279, depending on which day I calculated it.) Protein is good, but I think I would start gaining weight if I ate this breakfast of champions every day. Discouraged, I didn’t bother to enter any other food that day, afraid that SK would start recommending a Big Mac or a large steak. Next, I tried entering exercise. Since I had ridden my bike on the trainer for 30 minutes, I went to the cardio section. I searched on “bike.” None of the choices that came up were right – mountain bike, bike to work, etc. Next I tried “stationary bike,” and found one that fit. From there it was easy to enter the number of minutes from the drop down menu. Once you enter an activity, you can save it as a routine, so you can reuse the same entry on another day. Then I tried entering “weight lifting” as an activity. I had hoped I could just enter “weight lifting, moderate, 40 minutes.” But SK wanted me to individually enter each weight lifting activity, such as bicep curls, how many reps and how many sets. This proved to be too cumbersome and I gave up on it in no time at all. Finding my initial experience with SK less than stellar, I set is aside for a couple of months, then recently gave it another try. 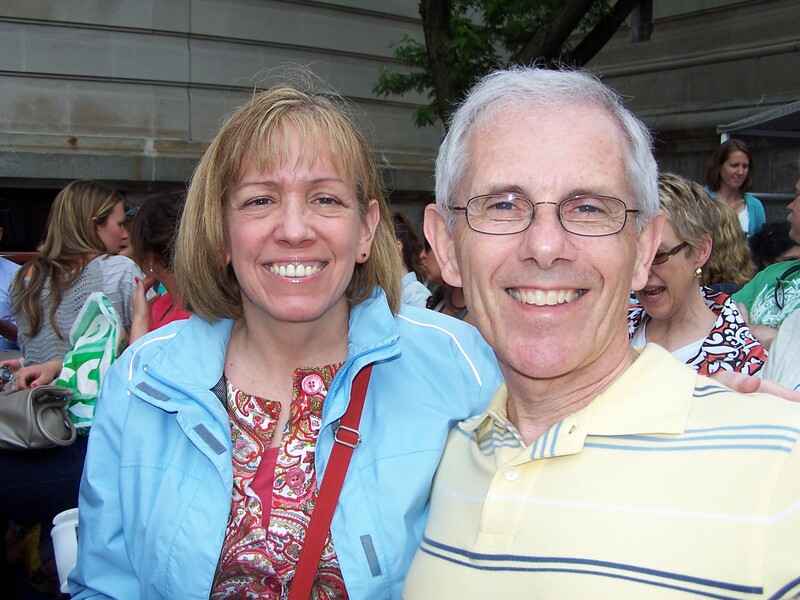 Best Husband has been participating in a similar program at his workplace wellness program, where participants log their exercise and steps, earn points, and can challenge each other in specific fitness goals. BH has been having a lot of fun with the challenges at work, so I decided to try the challenge section. I searched challenges that I could join, and found things like “give up soda for a week,” “no take out pizza for a week,” and “eat a salad a day.” I’m already doing those things, so I put out my own challenge to the members: Don’t eat cheese for 14 days.” So far, no joiners. The part of SK that I liked the best is the “log your weight” section. Click the drop-down arrow for the date, then add your weight in digits in the box. SK then plots your weight on a large graph. The graph is big enough that a small change up or down looks huge. Of all the features of SK, this is the one I’m most likely to use, as I think it would be satisfying to see my weight progress down on that big graph. That is, if it ever does. Who should use SlimKicker or other fitness tracking web sites? Anyone who enjoys participating in an online community with feedback and postings similar to Facebook. To get the best benefit from the online support, I suggest using the site with a buddy or group of friends with similar goals, and use the online challenges to help each other stay on track. Will I keep using SK? Probably not, although, I might keep using that big weight-tracker graph. Seeing that move down, down, down would be golden. 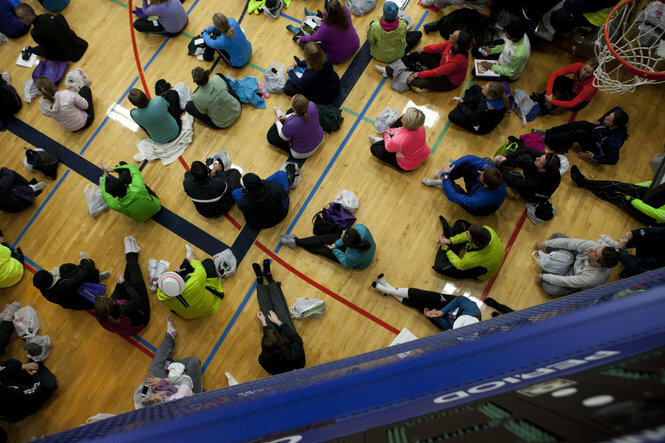 It’s that time of year when nearly 1,000 people converge on my gym, filling the hallways, classrooms and restrooms, to spend the next few weeks honing their running skills, or for most, starting a brand new running career. They are young, old, fat, thin, male, female. 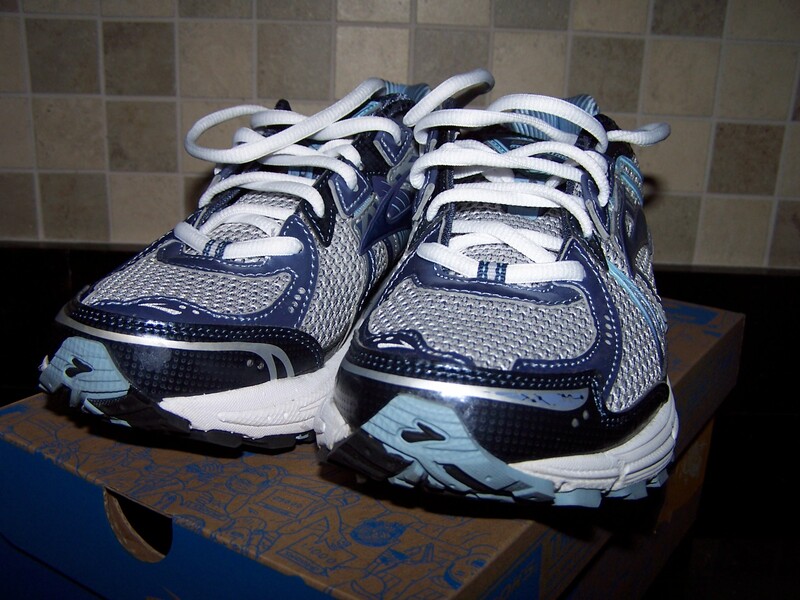 Most are sporting a brand new kit of running gear from head to toe: bright neon jackets with Icebreaker wool shirts and gators sticking out at the neck; Lycra tights that still have their out of the box sheen, and pristine running shoes, with laces still lily-white and toes unstained by mud or rain. They’re loud, laughing, excited; their nervousness is palpable. They cling to their friends and offer disclaimers to the run leaders signing them in. They clutch up in the hallways and block the entrance to the gym, where I must pass through their gauntlet to get to Saturday morning spin class. They sit in the walkways, feet splayed out in fresh new SmartWool socks, begging to trip me, as I make my way past to spend the first part of my Saturday in a dark room on a bike that goes nowhere. Last year, I hated them. I endured Saturday after Saturday wrestling my way through the rabid run campers to get to spin class. I resented them more each week. Not only were they clogging up the gym, blocking the way and taking our parking spaces, their fresh-faced enthusiasm at fever pitch, but they were running and I was not. Between years of arthritis, a bad ankle and an old hamstring tear, I didn’t think I could ever run again. Biking was going to have to be enough for me. 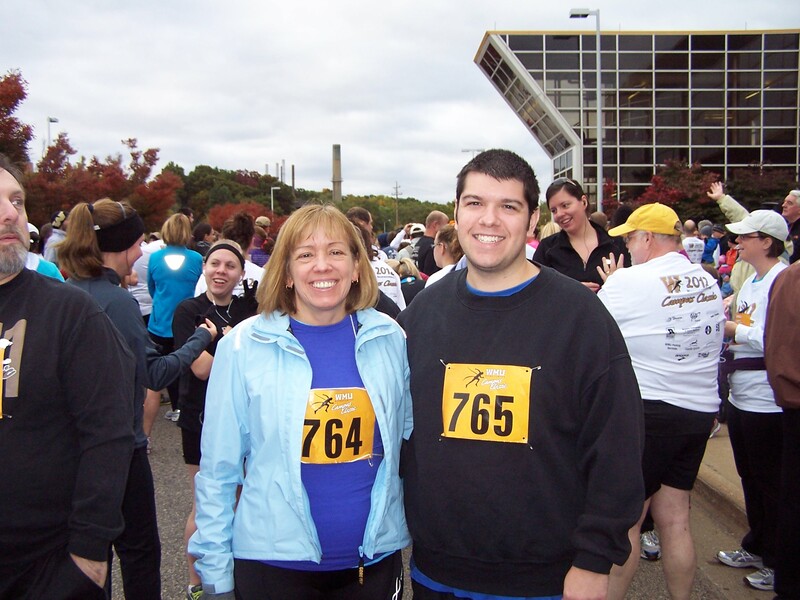 But I watched them week after week: overweight, out of shape people caught up in the flurry with their running peers. I watched them struggle through the snow as they left the building for group runs, their spanking new shoes getting wet and dirty while they straggled along at the back of their group, some not even making it to the street before they tuckered out and walked. And, they inspired me. So, as everyone knows who’s been reading this blog for a while, I had my own run camp. It lacked the benefit of group camaraderie, lectures from trainers and inspirational talks. But I started training and ended up a runner. Not a fast runner, not a long distance runner, but enough of a runner to satisfy that longing. So this year, I empathize with them. 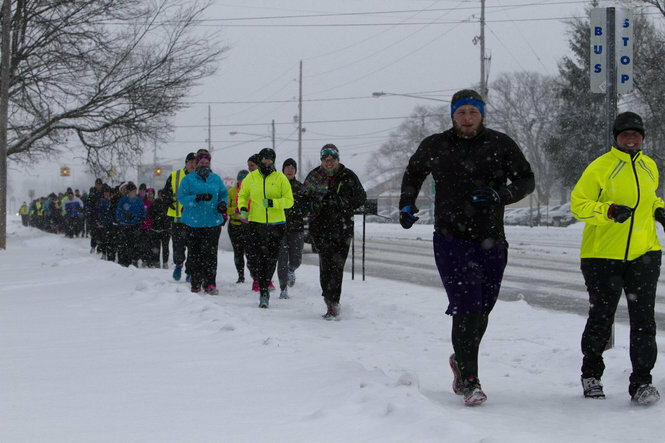 They are new runners, entering into the unknown, exposing their novice skills to hundreds of others, in the quest to run a 5K, a half, or maybe even a marathon. They’re trying something new where they might fail, might get hurt, or worse, quit before they find out what they could become. Now, when I put up with the inconvenience of hundreds of runners clogging up my gym for a few weeks, it’s okay, because, now I’m one of them. Then there’s the fabric. The fabrics of my real life are mundane, routine. Denim. Polyester. Cotton. But in my secret identity as “runner” I wear exciting cloth with exciting names: Merino wool from Australia. Compression Lycra. Moisture-wicking nylon. Gortex. All I need is a cape to complete the feeling that I’m running in a super hero costume. Except a cape would create drag and slow me down, so forget that. This is my first experience owning exciting athletic clothes, and I’m basking in it. Sure I’ve had athletic clothes before. I’ve got plenty of bike clothes, but let’s face it, except on those svelte professional riders, bike clothes do not look all that great. My second son cowers and declines to be seen with me in public in them. My first son refers to them as “my ridiculous outfit.” But running clothes? Nobody ever makes fun of those. Do Usain Bolt’s kids make fun of his clothes? Well,I don’t even know if he has kids, but if he did, I’m sure he wouldn’t get any grief over his running unitard. 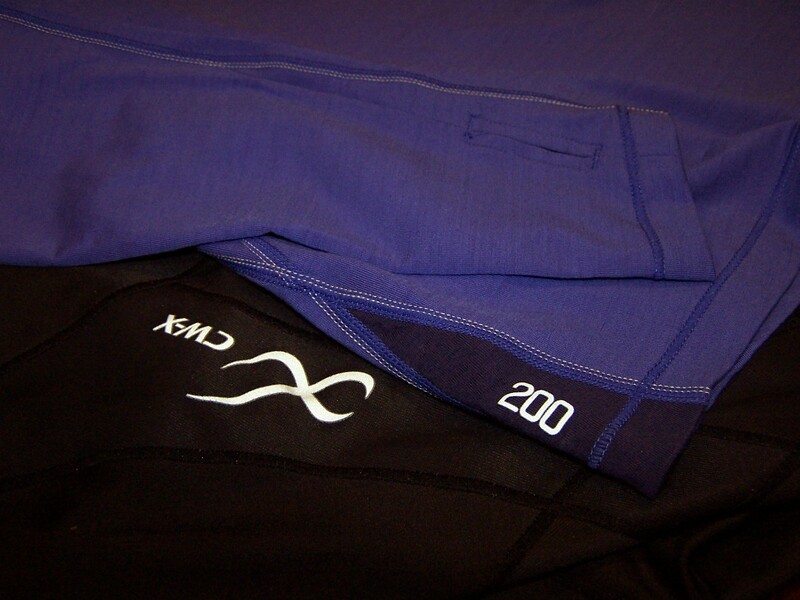 The best part of running clothes is the tech features. Running shirts are not just tees. They have panels and gussets and inserts designed to lessen drag, support muscles, and wick moisture. My sports bra has angled layers to get the job done. My base layer shirt is designed to keep me warm under the top layer while wicking away moisture, and has handy slits that let me pull the sleeves down over my hands, but still see my watch. In stark contrast, my everyday clothes sadly lack special features, and often disappoint. If (when) I get to the point where I can no longer run, I will mourn the loss of my running clothes. I could be like those aging senior citizens who wear jogging suits as everyday wear, a little blue-haired woman with a gaudy necklace and jaunty scarf made to match my zip-up sweats. But then I’d have to drive a Buick and live in a senior citizen compound, both of which I’ve already sworn to never do. For now, I’ll delight in my tech outfits, and savor every day that I’m able to don and use them. What is your passion of color and fabric? Christopher McDougall and me: Born to run, or not? If we are, as Christopher McDougall posits, born to run, why is it so hard, or nearly impossible, for most of us? I’m two years late to the party, reading McDougall’s 2010 tome, Born to Run, long after everyone else has already tried and given up on barefoot running and buying Chia pets to make their own chia seed elixir. 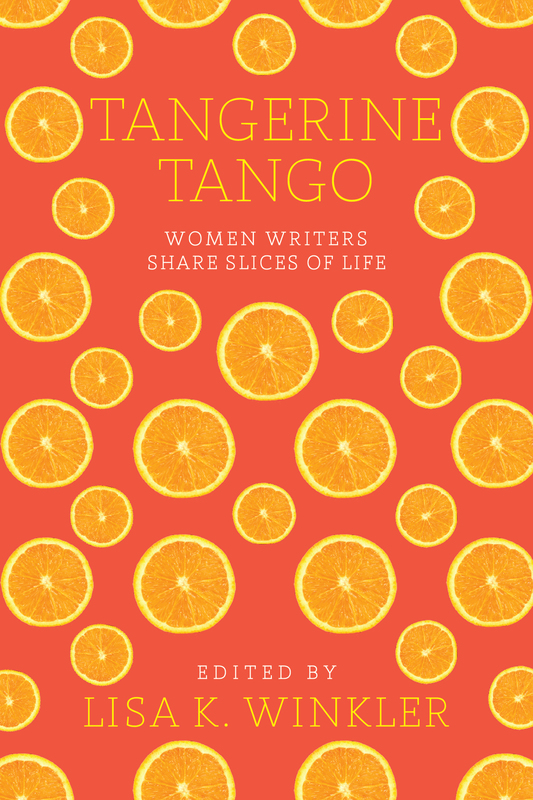 Yet, I’ve jumped on the bandwagon, convinced that somewhere in this book is the answer to how a middle-aged women with a non-athletic body can somehow be transformed into a modicum of runner. My goal to run two miles twice a week, and a few 5k’s a summer, so far has been mostly insurmountable, and getting farther away each day, as every run I take I swear will be my last. So I’m trying it again. Like McDougall, I’ve been to my family doctor, who gently suggested that walking might be a better option, ahem, at my age. I’ve been to the sports medicine doc who told me that as long as I’m unable to hop on my bad ankle, I’ll have no success running on it. My bike guru who had gently discouraged me, now says “I’m surprised you’ve lasted THIS long.” The only bright spot is at physical therapy, where, I’ve actually garnered some understanding of my aspirations, and surprisingly, some improvement, including now being able to hop on each foot. McDougall’s quest to run without injury brought him to explore the ways of the Tarahumara, a tribe of super runners, and the Leadville Trail 100 ultra-marathoners, all of whom run amazing distances year after year, without harm. If those folks can run like that, shouldn’t McDougall and I be able to run our paltry little distances injury free? Unless McDougall’s writings are sheer hyperbole, perhaps I’ll find the answer by the time I finish the book. Have you read McDougall’s book? What physical achievements have you accomplished, despite the odds tilted against your success? I grew up before there was Title IX, graduating from high school the year before Title IX became law. What was it like back then (okay, way, way back then) for girls and women in average small town America? Where I lived, there were no high school sports for girls. If you wanted to “play” a sport, you could be a cheerleader. Except, you had to be cute, little, peppy and popular. That left out me, and most everyone else. What to wear? There was very little sports apparel made for women. No sport’s bras – not invented until 1975, and not perfected until much later. No athletic shoes – unless you count good old canvas sneakers, aka Keds. The only women’s sport’s apparel widely available (besides those darn cute cheerleader outfits) were for sports that highlighted individual women, who needed to look good while playing. You know – tennis, golf, swimming. Individual sports that required fancy equipment and lessons, so not open to just anyone. Even though many of us did not benefit from Title IX in childhood, we all benefit today. Now women’s athletic gear is widely available to everyone, from the pros to the weekend warriors. I even have a women’s specific bike AND a women’s specific tire pump. Women can compete in most sports in the professional and amateur levels. Women are no longer relegated to just being peppy cheerleaders, that is, unless they want to.When you watch the Olympics this year, think about the US women competitors who benefited from Title IX. Get started here, with this Cubs fan. 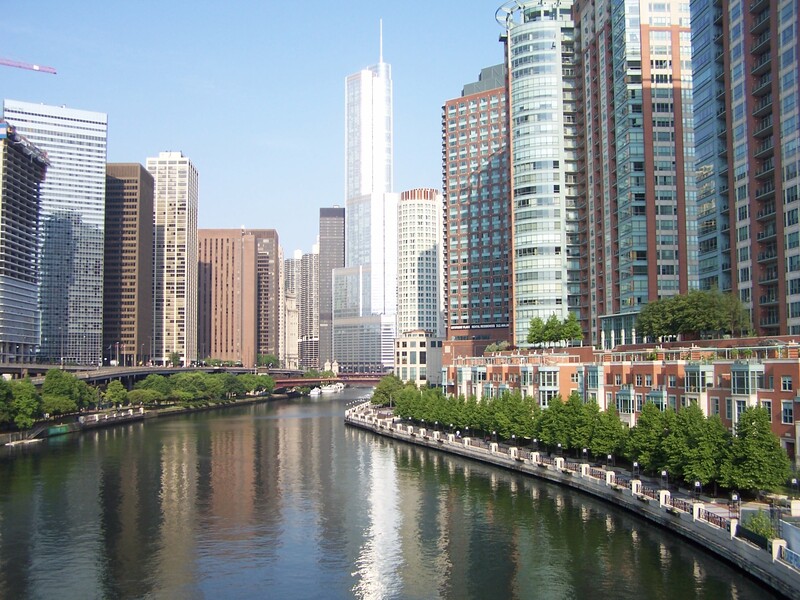 On this trip, we saw Chicago from two great vantage points: by water and pavement. 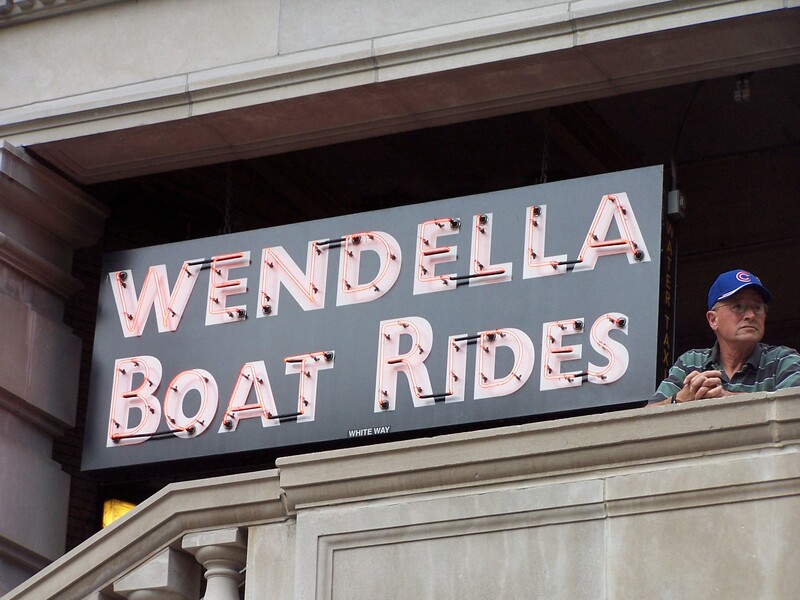 We started our water tour at Wendella’s Boats, a Chicago fixture since 1935. We chose the Chicago River Architecture tour for around $25 plus the usual exorbitant Chicago taxes. We bought our tickets ahead online, which spared us from standing in the confusing queue at the dock. Be sure to go to the Wendella site, and not a ticket broker, which adds at least $10 to the price, then tells you you’re getting a “discount” by buying online.We took the 4:30 PM tour, which seemed less crowded than the one that took off before us. The boat quay is right below the Wrigley Building. 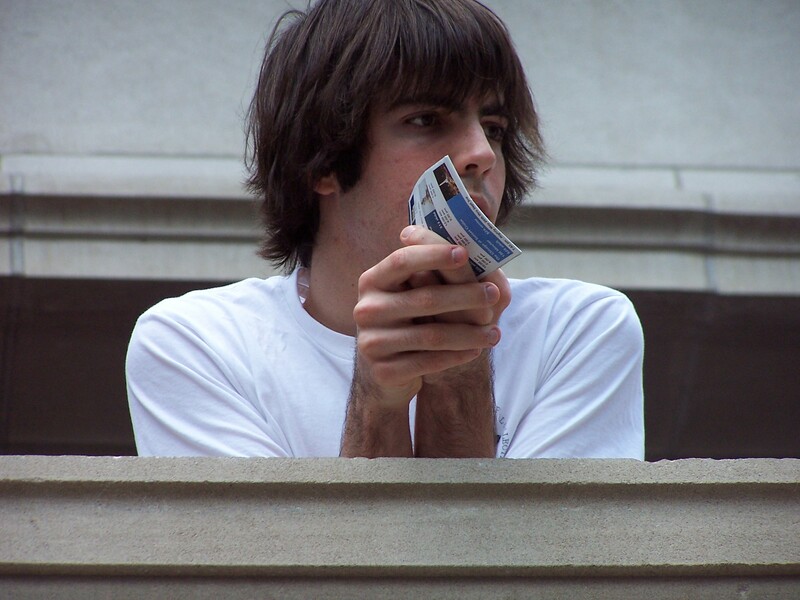 He’s got a ticket to ride! 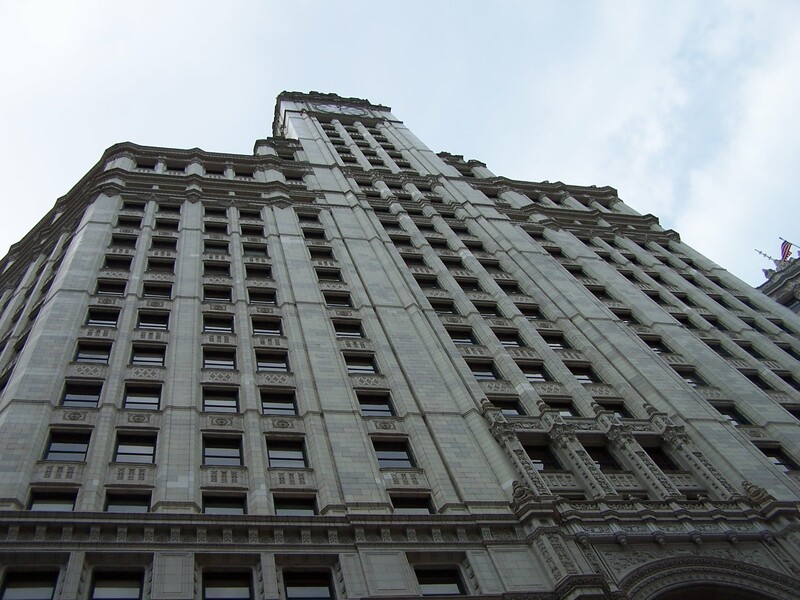 The tour guide gave an informative discourse of the surroundings and buildings, as well as some interesting Chicago history. Even if you don’t care one whit about architecture, you get a nice tour of the second city all the way up to the locks to Lake Michigan. (Who knew Chicago had locks?) This was a great way to see a lot of Chicago in a short time (about 70 minutes, plus queue time), and get a fun boat ride. The next day we ventured out by bike shortly after 5 AM. 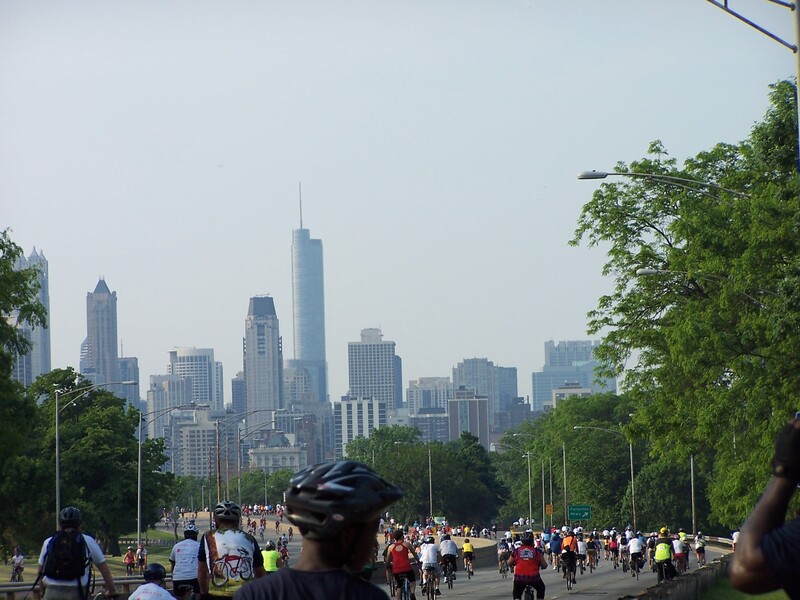 The streets were deserted except for a few other bikers and police, as we biked the two miles or so to Grant Park. 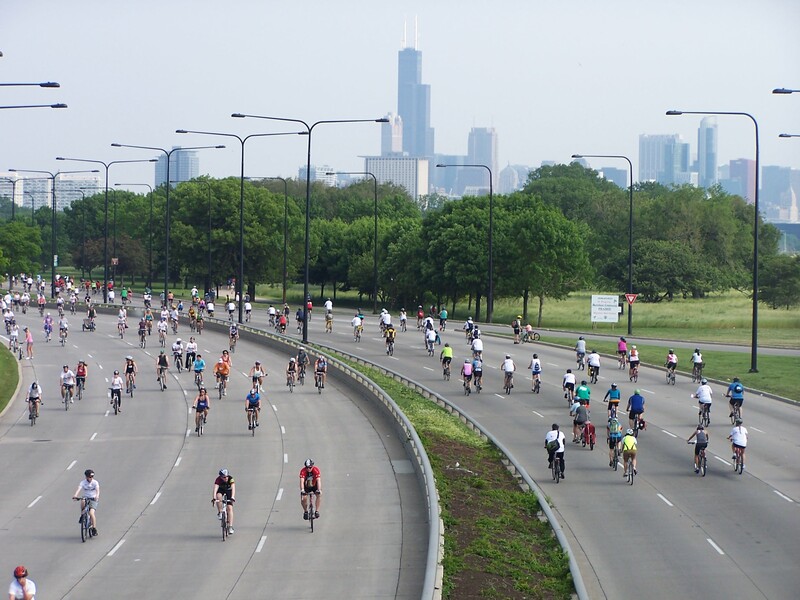 There we joined thousands of other cyclists to “Bike the Drive,” the once a year event when fifteen miles of Lake Shore Drive is closed to traffic and open to cyclists only. 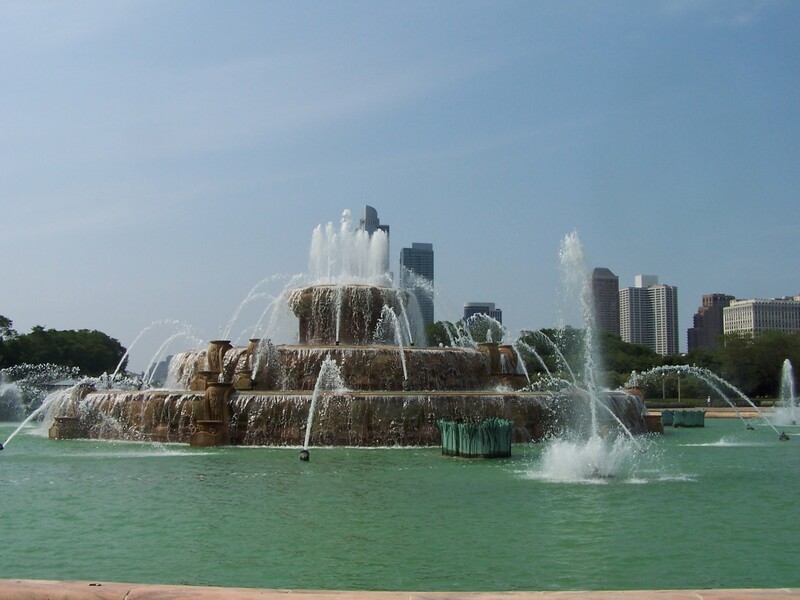 There are two 15-mile loops: north from Grant Park to Bryn Mawr and back, and south from Grant Park to 57th and back. The north loop has excellent views of Lake Michigan, Navy Pier, and the amazing LSD skyline, including the famed Drake Hotel. The south loop passes the picturesque museum campus, the formerly beautiful Soldier’s Field, now marred by the giant spaceship that landed in its center, and famous McCormick Place. The north loop has a few smallish hills, but nothing that an average biker couldn’t master; south loop is mostly flat. Dave at the museum rest stop, mostly deserted so early in the morning. Starting at 5:30 AM ensures a less-congested ride, and more room to stop and snap photos. 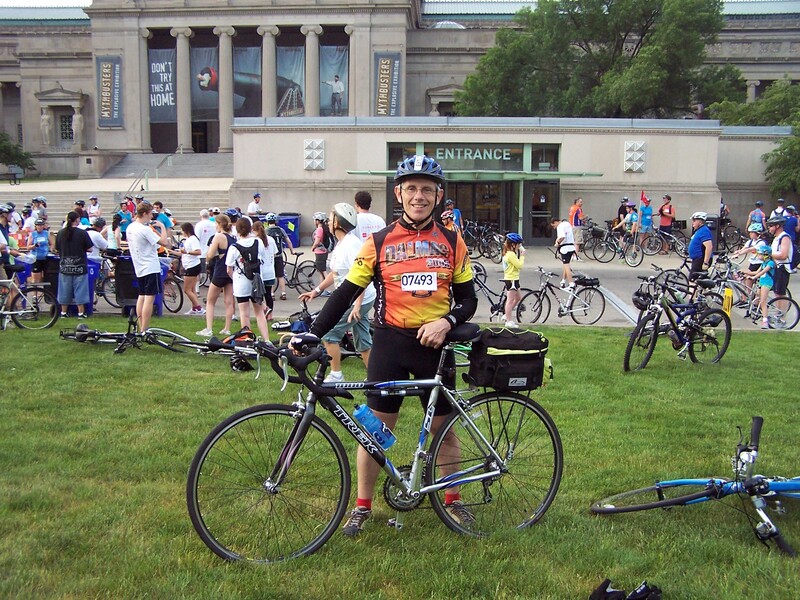 Folks of all ages participate, including many who have no idea how to ride a bike safely. Watch out for hammerhead cyclists on your left, whizzing by at 20-25 mph, and little kids who’ve biked out of reach of their parents, and have no idea they shouldn’t be weaving back and forth right in front of you. You’ll get the best experience if you are fit enough for a long ride and stay alert for hapless riders around you. The north route tends to be the most crowded, but both routes get crowded after 7 AM. Iconic Chicago skyline, heading towards Grant Park from the north loop. This year we ventured south first and enjoyed seeing the Museum of Science and Industry grounds relatively crowd-free. We had great views of the lake and skyline on the north route, and for the first time ever stopped on the bridge to get some amazing shots of the river. Great view of the river from the bridge. After finishing our 30 miles in record time, we added an extra half-loop going south again. This allowed us to snap some over the road shots of the cyclists below from the bridge turn-around. Looking north from our perch on the overpass. We finished up at Grant Park to collect our T-shirts and enjoy music and pancakes among the thousands of others sprawled on the grass and benches in the near-90 degree heat. 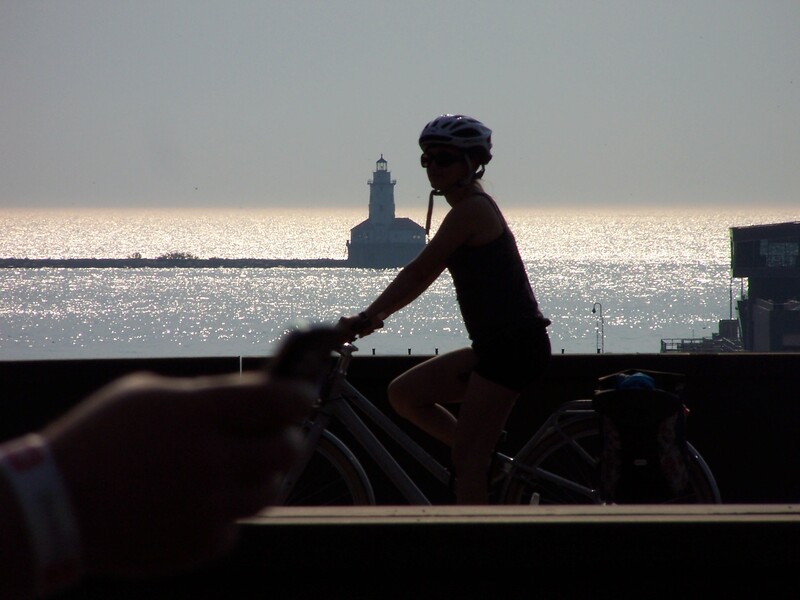 Chicago Harbor Light, framed by cyclist.